Ladies and gentlemen, your NEW undisputed, uncontested undefeated and untied BTS season leader … Mr. Steve Summer. Ichiro came through yet again for our main man last night, advancing Steve to 42 games with a single in five at-bats against Jerome Williams and the Angels. Only 14 other players have reached 42 games in nearly 11 seasons of BTS play, and one more correct selection would vault Steve into a tie for eighth place all-time in this here Streaking game. Of course, no Streaker has ever reached the mythical land of 56 games — a mark Steve could challenge as early as Sept. 13. 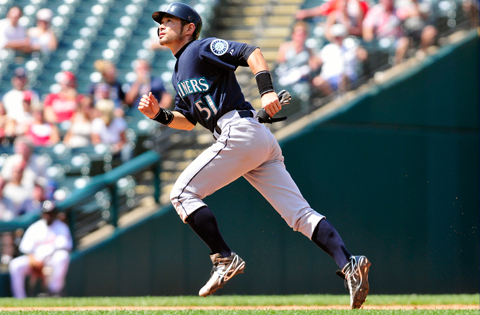 That is, if the stars align, the tea leaves are favorable and Ichiro keeps on hitting. 143+ ? If so, could start putting some pressure on w25. Yes. Don’t know how much ime is left but it’s at 141 at the moment. So it’ll hit the over. I just noticed that I am now the LEADER in the active bloggers group!!! And, of course, I have a narrow 1-game lead and had no clue who to pick today, so I went with the normally reliable Ichiro against Dan Haren. Upon looking at Ichiro a bit closer, I noticed that his strikeouts are way down recently, which had previously been the sign that he was slumping. So here’s hoping that he’s just getting ready to break out! Does the SFTC carry over to next month? If not, why are people with lower streaks even playing? Why not wait? Still up in the air. There’s one guy with active w25 and one at w23 both with a chance to get 27. Ok, I’ll be keeping an eye on them. W23 going with Ukraine to lose by upto 14. Where do you guys go to follow European basketball? An that’s the ball game. Russia wins but only by 9. Now we have a w24 & w25. Should be an interesting finish to the night. Interesting there as the only other hitter I was considering for tonight besides Ichiro was Marlon Byrd, who got the only other hit for the Cubs today. I was just scared off because Byrd has struggled so badly against the Cubs this year. Correction: has struggled so badly against lefties* this year. Leader and co-leader in SFTC at 26 and 25 respectively with Beckett’s strikeout. One more for the leader and prize money is reset tomorrow. Unless the co-leader is able to win it. Adam Lind gets me to 5 and I’m in position for my 1st save since the 21st (exactly 10 days ago) with Craig Kimbrel. The Braves are up 3-1 after 7 so I am looking for a tie in the 8th inning or either team to outscore the other by 1 at the most. I’m trying to break a 9 day futility in the FR BTS game. I’m finally back on board on Fast Relief BTS.